It all started in 2005 as the Ministries of Education and Employment appointed a working committee with the task of creating a programme for action to develop guidance related to information and counselling services in adult education as well as studies that support career and education planning. The aim was to provide, by 2008, citizens with diverse and customer-oriented information and guidance services. Another goal was to have guidance arrangements also suitable for adult studies at the disposal of adult education. As the result of this group’s work, a proposal for action was produced in the programme for the development of information, guidance and counselling services in adult education. In everyday speech, this report is also known as the ”365 publication”. Based on this proposal, the national development programme of Usefulness and needs as the basis in adult training and education for information, guidance and counselling services was launched. The development programme consisted of more than 50 Opin ovi projects with hundreds of guidance professionals working hard in the development network. The goals were not completely met, and the services geared towards adults remain fragmented. Opin ovet produced new kinds of models and operational methods for adult customer guidance and counselling: networking-produced service models and flexible, knowledgeable guidance networks. It gave birth to new kind of know-how: network-like approach to guidance work and basic network know-how. In conjunction with the development work, many guidance tools and guidelines were created, as well as several agreements that guarantee the continuation of the collaboration and actions. The Opin ovi work is done , but it is not enough. We can still pose the following questions: Do all citizens receive guidance and counselling services equally? Do the services address the individuals’ needs? What is the state of the guidance quality system? Does guidance function as a coordinated whole? 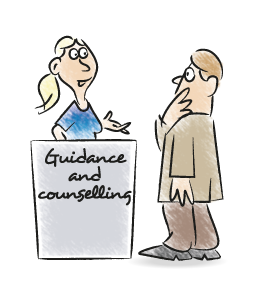 The significance of guidance and counselling is especially evident during the transition phases: as people seek training possibilities, as they shift from one form of education to another, as they enter working life after education, and during transitions in their active careers. These require functional, multi-channel, and easy-to-reach information, guidance and counselling services for adults as well. All these assist citizens in gaining employment, getting an education, or otherwise strengthening their professional know-how. This publication describes the development programme (Opin ovet) as a whole. The regional projects were a centre of development, supported by national projects such as the STUDIO and ERKKERI training programmes. The publication describes this support work and the results that were gained in regional Opin ovet projects. Answers to, among others, the following questions are to be found in the publication: what did not take off, what continued to live on and flourish, and which recommendations were given for the next ESF round. The next structural fund round of 2014-2020 related to Sustainable growth and employment will focus on developing low-threshold Ohjaamo services for the young, which is a good thing. However, there is growing concern about the guidance and counselling services geared towards the adult population dwindling even further, as the majority of resources is allocated for the young. Life-long guidance spans from early childhood education to seniors. Would it finally be the time to develop services in a true life-long guidance manner instead of targeting a specific group? The society-given guarantee of work and education belongs to everyone, adults included. Life-long learning always presupposes life-long guidance, which entails assistance in making choices related to studies and careers. High-quality guidance matters – both in making careers last longer and in increasing productivity; and most of all, in preventing alienation in all age groups! Good guidance – a better life.